If you’re familiar with my old posts, you probably noticed I shared all the books—with cover art—that I’d read that week/month. Missed those days? Check here for an example. When I created my public page on Facebook I started sharing my current reads there because it’s much easier. 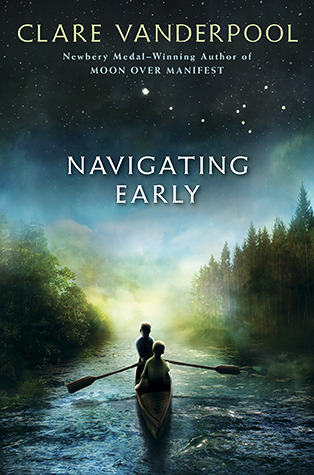 But since I was fortunate to receive an ARC (advance reader copy) of Navigating Early by Clare Vanderpool, I wanted to spread the love here as well. It’s rare that I actually get a copy of a book I request, and this copy was even delivered on Christmas Eve—merry holiday to me. I’m not one to write gushing reviews, but I’m opinionated and will recommend books to people when I like them. • Target audience: 10+: all my favorite novels are! See http://authorcarriecox.com/2012/10/17/all-for-love-a-middle-grade-reader-romance/ for more recommendations. • A story within a story: think Holes. • The turmoil on the inside of the character is as strong as the pressure on the outside: I like quiet novels, but this one has more than enough exterior conflict to keep reluctant readers going. • Tidbits of real information sprinkled throughout: I love learning through novels. Navigating Early releases tomorrow, January 8, 2013. Do yourself a favor and get a copy, or you could beg to borrow mine. This entry was posted in Aspergers, books, Clare Vanderpool, CURRENT EVENTS, historical, literature, middle grade, Navigating Early by Carrie Dalby. Bookmark the permalink.